As many of you know a couple of weeks ago I purchased a new MacBook Air as a replacement for the MacBook Pro I’ve been using the last few years. Some of you were interested in knowing what I thought of the Air. Now that I’ve had about 2 weeks to play with it I can offer some thoughts. I do like it, plan on keeping it, and have found it works well for my needs. Let’s get to the details. Note: In the last post I used images I found online. 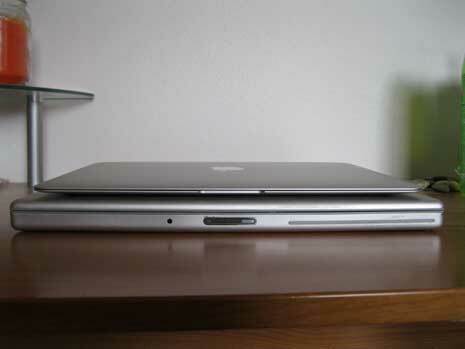 This post features images of my MacBook Air and my old MacBook Pro. In order to put my thoughts into context you should know a little about how I use a laptop, which is mainly as a desktop replacement. My laptop needs to be able to handle everything I do. Most of the time that means I buy the most laptop I can afford when it’s time for a new one. Prices over $3,000 don’t scare me. My laptop is, after all, the most important piece of equipment I use to run a business. The last year I’ve started thinking a better approach would be to have 2 computers, a smaller lighter laptop that can handle most everything I do and make travel easy and then a more powerful desktop for when I need more power and/or a bigger screen. My typical day mainly involves working with text files. I’m usually writing or coding. My next most common tasks relate to working with images and graphics. I’d like to work more with video, but don’t at the moment. Naturally I surf the web, check email, read my feeds, etc. The safe choice would have been a new MacBook Pro. It would represent the most laptop I could afford. However I’ve wanted an Air ever since they received a refresh last fall. I had a few hesitations about the Air in regards to power/speed, size, and glare, but as long as I felt it could deliver enough laptop, it was what I planned on getting. I was hoping the ssd flash memory would make up for the lower RAM. Here are some specs of the 2 laptops I was thinking about along with the same specs for my 2008, pre-unibody MacBook Pro. When you see a (?) listed it’s because I can’t quite remember the spec on the old laptop. The number before the (?) is likely close, but I’m sure it’s not quite correct. You can click on the new Pro and Air links to see the full specs at Apple’s site. When I considered the specs above my main concern was the greater RAM I could get on a new MacBook Pro, but given a new Air still had more than my old Pro I figured the Air would work well enough. 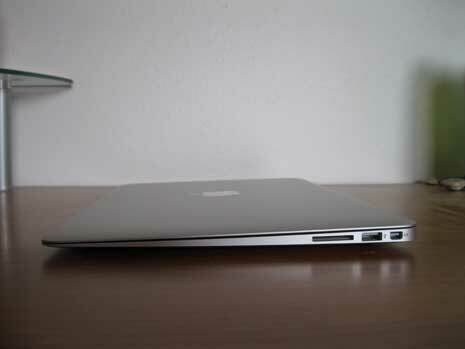 With the above in mind let me share my 2 weeks of experience with the MacBook Air. For something so thin and light, the Air feels sturdy. I assume that’s due to the unibody construction. 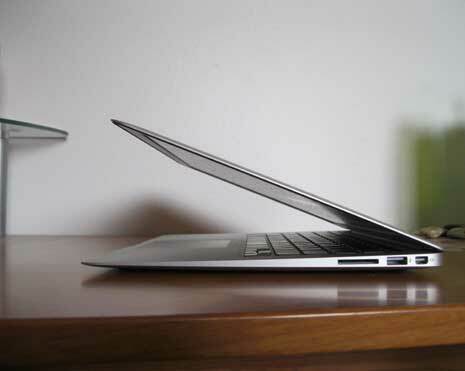 It’s sturdy enough that the hinge between monitor and keyboard can take more force than the weight of the laptop. If you push too quickly and too hard on the monitor you can easily tip the Air. When the Air is on my lap it hardly feels like it’s there. I haven’t carried it around with me when I leave home, but it’s not hard to see how it will be a joy to travel with. I think the keyboard is the same as the new MacBook Pros. It’s a little different than my old Pro. The keys are flatter and there’s no backlighting. The lack of backlighting isn’t an issue as I usually have a light on when I’m using the laptop. I’ve yet to think I wish I could see the keys better. It did take me a couple of days to get used to the keys, which are in slightly different positions from what I’m used to. I occasionally reach for something that’s a little further to the left or right than my muscles remember. Typically though for every time I switch to a new computer. 2 weeks later and I like the keyboard better, especially as my old laptop had a few keys not working too well (‘a’, ‘m’, ‘p’). The touchpad is also a little different than the one I’d been using. My old Pro had a dedicated button. The Air doesn’t. Neither does a new MacBook Pro. I guess I’ve always dragged my finger across the button when clicking. When I do that now, I sometimes move the cursor prior to the click which then no longer works. I’ve been getting used to it and getting better about not dragging before clicking, but it’s been my biggest annoyance. Hardly a big deal though. I’ve been using 15 inch screens for a decade and worried 13 inches might feel too small and cramped. Maybe it’s because the resolution is the same, or that 13 inch isn’t that much smaller than 15 inch, or that I adjust quickly, but the smaller size hasn’t been an issue at all. At first I did notice I was working on a smaller monitor, but within a few days I was simply working on a monitor. Everything looks just as good as it did on the old laptop, only it’s all a little bit smaller. Not a lot smaller, but a little smaller. If you think it might be to small for you it’s worth going into an Apple store if there’s one near you. Play with the Air for a little while and switch to a 15 inch Pro and then back again. You should get a reasonable idea whether or not you can work on a 13.3 inch monitor. I’ve been using antiglare monitors since they were first available. I really don’t like glare and I was nervous about how it would be to not have an antiglare screen, especially as I work with a light right behind me. Fortunately this also hasn’t been an issue for me, though I can easily see how it could be an issue for others. I tried to show this in the images above and below this section. In the image above I knelt down and looked at the screen from below to capture the image and you can clearly see the reflection of the window behind me. In the image below I simply stood up and took a picture from above. The Air itself never moved and I assure you the window didn’t either. In both images the glare is magnified from what I usually see. My live view looks better than what was captured in either image. When the monitor is sitting near 90 degrees from the keyboard and I look at it straight on, I don’t see any glare. Under those conditions I feel as though I’m looking at an anti-glare screen. Since those are the normal conditions under which I work, everything has been fine for me. If you like to have the screen tilted further away from you, then you probably will see some glare. Again if you can visit an Apple store and tilt the monitor back like you normally would, you should be able to quickly tell if glare will be an issue for you. I’m not sure if the lighting I use is helping. Recently I switched to using energy efficient light bulbs, which throw off a cooler light than the soft yellow bulbs I had been using. I thought I’d mention it in case it does make a difference and you want to give it a try. This was the big issue for me and probably is for you as well. On the bright side I knew the Air was more powerful than the Pro I was replacing. I also suspected that speed bottlenecks with the old laptop had more to do with reading and writing data from and to the drive than any lack of processing power. The majority of work and play I do on the computer isn’t all that processor intensive as I mentioned above. More processing power would be nice, but realistically I probably don’t need more. The first night with the Air it got very slow. So slow that my initial thought was I’d be exchanging it for a Pro almost immediately. Firefox wouldn’t open, programs kept freezing, and I had to restart by turning the power off and on. Then I got the bright idea to actually restart once through the operating system and everything changed for the better. I introduced human error into the process of migrating data, which I think caused the initial slowness. 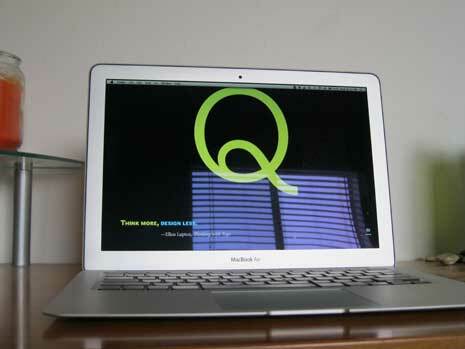 Since the restart everything has been noticeably faster than the old MacBook. Programs open much quicker (1 or 2 bounces as compared to 10). I can also have more applications open for longer periods of time. On the old laptop and even on every Windows computer I’ve ever owned I would never leave Photoshop open when I wasn’t using it. It’s not a problem on the Air. I can leave Photoshop open all day or week without anything else slowing down. I still get an occasional beach ball and Firefox still slows down some after watching too many videos. The Air isn’t perfect, but overall everything is noticeably faster than the old MacBook Pro. Unfortunately I have no way to compare and contrast with a new Macbook Pro. All I can tell you is everything is fast enough for me. The flash drive does make a huge difference and I can’t see myself ever again buying a laptop without flash memory. I thought I’d collect a few other reviews of the MacBook Air for you. There’s no rhyme or reason to the links above. Just me doing a search or two and grabbing a few random reviews from the results. I tried to grab reviews featuring the 13 inch Air. You should be able to tell I’m happy with my purchase and plan on keeping the Air. There will always be part of me that wonders how it compares with the new Pros and I’ll likely be jealous of whatever upgrade the Air gets later in the year, should it get one. Still I’m very happy with the MacBook Air I purchased. The potential issues I thought I might have turned out to be non-issues for me. I can see how they might be issues for others, but I’m good. If you are thinking of getting an Air hopefully something in this post has helped in your decision. 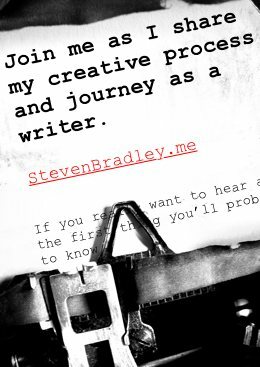 Feel free to ask specific questions in the comments or shoot me an email if there’s something I didn’t mention here that you’d like to know. My best advice is to go into an Apple store if one is nearby and play with both the Air and the Pro and see what you think. Keep in mind Apple won’t charge anything if you come back within 2 weeks and want to return your purchase. That way you can test out the Air and see if suits you. 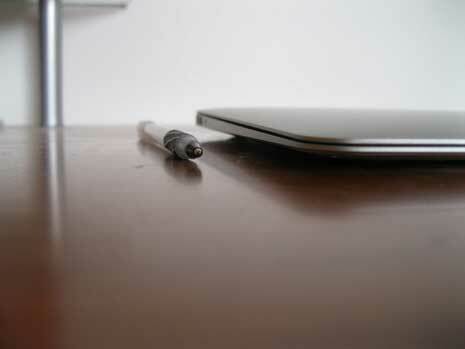 I love the new MacBook Air’s … especially for their weight and optimization. It’s really hard to improve the MacBook Pro, but I feel like the Air is similar to a finely tuned french super-sprint car (sans mustache). Funny. Maybe I’ll paint a mustache on the lid below the Apple logo. I’m sure the Pro is ultimately a better machine, but so far I’ve been impressed and happy with the Air. I have a 1st gen MacBook Air. It’s the most worthless piece of hardware I have ever purchased. This is a 2nd generation Air. I think the news ones are very different inside from the 1st generation. I love the Air and how it looks. I think it definitely has its place but as a designer who needs that extra punch from the performance, I’d always go with the MacBook Pro over the Air. I’m sure it runs things quite well, but when spending that much on equipment, I want it to last that little bit longer. 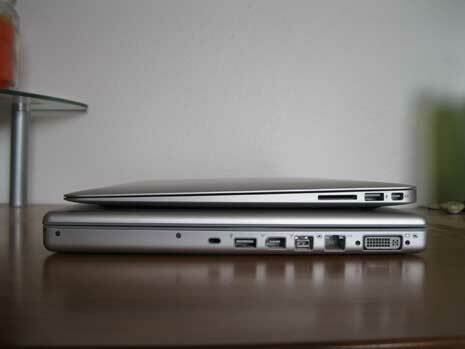 Do you think that maybe you’ll be replacing your Air sooner than you’d have replaced another MacBook Pro? Maybe that’s not an issue for you but the cost and time involved puts me right off. Matt I was originally thinking the same thing about the performance. Then I started thinking about it and wondered if designers (at least this one) really need the extra processing power. Where development is concerned we’re really just working with text files. It doesn’t take much processing power to modify and save a file. If we’re testing an application it even makes more sense to use less power since most of our users will have less power. It depends what tools you use. For me Photoshop seemed to be the most processor intensive program I use. So far it’s opened quicker and is able to stay open longer without slowing anything down. Combine that with the Air being more powerful than the Pro I had been using and I figured I would be fine. I’m sure the new Pros are better and more powerful machines, but I’m no longer sure I need that extra power. It’s hard to say how soon I’ll have to replace it. I’ve been on a 3 year cycle with laptops ever since the first so if this Air lasts me 3 years I’ll be happy. I’m thinking at some point (a point nowhere in the near future) I’ll get an iMac, which I’ll use for the more processor intensive work. I’d rather not spend money either, but the Air is actually one of the least expensive laptops I’ve ever bought. It turned out to be about $800 less than what I would have configured a Pro to be. The first gen Airs were purely about size. The newer iterations have some pretty impressive hardware in them. It’s great what Apple are doing in terms of size, weight and battery life. I agree Ben. 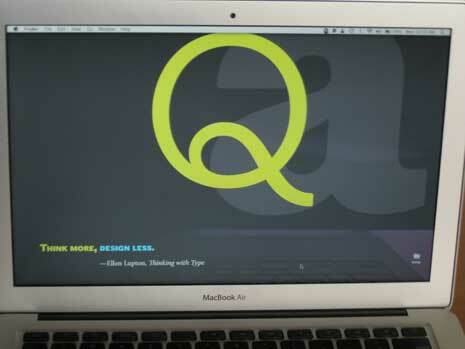 As soon as the 2nd generation Airs came out I could see their design would eventually find their way into other Macs and then probably other laptops. I had actually been hoping the new Pro lineup would remove the optical drive and take on a similar shape, but it wasn’t to be this year. The hardware is a lot better than I thought it would be and it’s amazing to see how thin the Air is and realize somehow Apple managed to fit all that hardware in. At the moment I don’t, though one of my considerations was that for the same price I would have spent on the MacBook Pro as I configured it, I could get both the Air I now have and a 27 inch cinema display. I’m thinking instead I’ll wait a little longer and save up to get an iMac. The smaller screen hasn’t been an issue at all. It pretty much looks and feels the same as the 15 inch screen I was using. Right now the only downside is that I’m hearing the Air’s are going to get an upgrade in June. I had been hoping I’d be able to hold out till then, but it wasn’t meant to be. For a time in June and July I’ll probably be a bit envious over what I could have had, but that’ll be true from the moment something new comes out till the moment I buy whatever comes next. I can buy a MacBook Air from a decent shop down the road in Saigon, but I am concerned about how hot it will get. I presently use what seems quite an ancient device, a PowerBook G4, and it gets hot while I am just attending to e-mail and browsing the Internet. I need a computer on which I can look at photographs sent over the Internet and send photographs that I load in with an reader of cards from a Canon camera. I may also create simple concept layouts (not ready for print) and I will create and edit texts. I am not interested in anything that seems to me like luxury, such as movies. I would use still pics taken by the camera at the top of the screen. 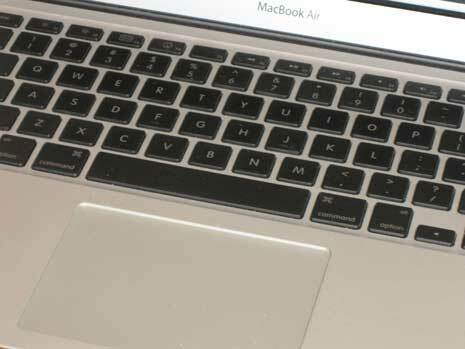 Could it be that the MacBook Air was actually aimed at people like me, who do not need heavy-duty work (leisure for the user) from a computer? Do you think that if I use the computer in the way I propose it will get hot? The heat from my PowerBook G4 is somewhat alarming, though the machine does not falter. Getting too hot hasn’t been an issue for me James. The only time I hear the fan come on is when a video is playing using Flash. Even then the Air doesn’t feel hot to me. All the work you mention shouldn’t require a lot of processing power. I would think you’d be ok with an Air. Keep in mind that I bought this Air a few months ago and if the rumors are true later this week or next the Airs will get an upgrade with a much faster processor. If you can wait another week you’ll be able to get a better Air than you can now. I wish I could have waited, but I’ve been happy with my purchase. I want to buy a macbook to. The pro has a lot more options I think ? The hard drive is bigger, up to 750GB. But the air has an SSD with 250 GB. So that will make things a lot faster. The pro has an i7 2.9Ghz prossesor en 8 Gb ram, while the air has i5 2 Ghz and 4Gb ram. -Can you connect another screen on the Air ? On the pro this is possible. -The air would be easy to travel with, but how was this with your pro ? -How was the duration of the battery ? -Did you hear the vans working ? And did he get hot you Pro ? The air has SSD so normally won’t become hot I tought ? I really hope you can help me with making the desision! Hi Arno. I won’t be able to answer all your questions, but I’ll do my best. The Pro definitely has more. Between the two it’s the more powerful machine. The Air is lighter and more portable and for me, at least, powerful enough. Plus my Air is about 2 years old now and the new ones are even more powerful. I’ve never connected an external monitor to my Air, though I have connected my iPad as a 2nd monitor through an app I purchases. From what I understand you can connect new Airs to an external monitor, though I think you have to use one with a Thunderbolt connection. The Air is definitely easier to travel with. It’s not like I couldn’t travel with the Pro I used to have, but the Air is noticeably lighter. I rarely use it on battery. It’s mostly plugged in. I wish I could tell you how long it lasts, but it’s never been an issue for me. I hardly ever hear the fan going. It’s not that I’ve never heard it going, but as I’m writing I can’t remember the last time. It will get hot in one location, which I think is where the wireless is located. It’s in the upper left of the keyboard, mostly outside the keyboard. It’s not in a location reach for much. When it’s in my lap I have a tray underneath it so I’m never in contact with the bottom. I reached under it now and it’s a little warm in the same spot where I notice it occasionally getting hot on the top. It really hasn’t been any issue though. I hope that helps. If you have more questions feel free to ask them.